In Christianity, January 6 is the feast of the Epiphany(the 12th day of Christmas) and churches celebrate with the Adoration of the Magi as the realization that Christ is the Incarnation of the son of God. In Florence, the celebration involves a long, grand parade in magnificent costumes which evokes the arrival of the three Wise Men to the little town of Bethlehem in search of the Messiah. It is a beautiful parade and we highly recommend seeing it – in fact, it is a very good reason to visit during the holiday season and extending your visit until January! The celebration goes back centuries to 1417, when the solemn cavalcade was then repeated every 3 or 5 years, at one time even the male members of the Medici family took part. 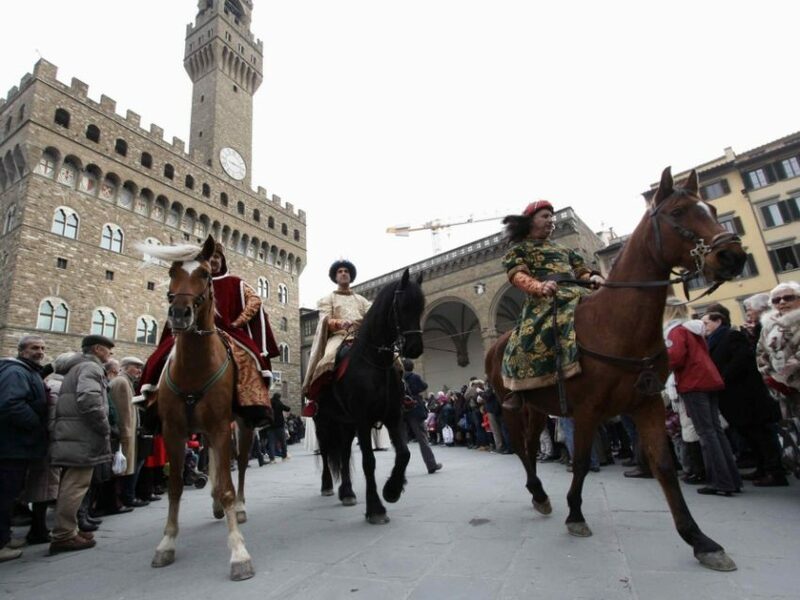 For this reason, it seems the celebration was stopped in 1494 when the Medici family was expelled from Florence. The celebration was resurrected in 1997 during the celebrations of the Seventh Centennial of the cathedral. So what do you see? The three Wise Men arrive with their gifts of gold, frankincense and myrrh, with the cavalcade of over 500 participants from all over Tuscany behind them joining in the celebration. A life nativity with Christ Child, Mary, Joseph and manger with farm animals is set up in Piazza Duomo. Ladies and lords, knights, country folk, soldiers, religious figures and more: drummers and the sbandieratori or flag-throwing company of the Uffizi enchants the public with their skills in throwing and waving their flags along the way and in Piazza della Signoria.